on the top bar menu. For models and pricing click on the pictures or go to Greenhouse models on the top bar menu. The philosophy at Essex Greenhouses is to produce a top quality greenhouse at a fair price. The unit should be able to withstand both wind and snow loads and be constructed for ease of assembly by the customer. The unit should include the essential equipment within the unit price. To use the expression “off the shelf “ would be incorrect for our greenhouses. 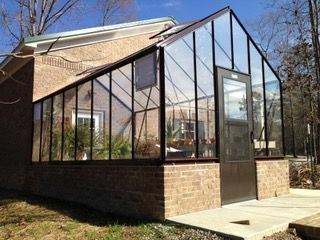 Each aluminum greenhouse that we sell is custom built. The units are individually inspected and packed for each customer without exception. Essex Greenhouses are NOT a mass produced imported product. If the customer requests a special option on the greenhouse we will pre-assemble the section to make sure all parts are within specification. for each order. We start the design by using only the best in materials. The aluminum extrusions are all manufactured using 6063-T3. This alloy is a high grade material that gives the frame both strength and durability. The frame is then put together using stainless steel “T” bolts and stainless steel captive nuts (this is a nut with a shake proof washer mounted to it). This prevents the unit from coming apart due to vibrations from the weather and other anomalies. Finally we incorporate 6mm twin wall polycarbonate set on 24” centers. This provides strength against the winds up to 70MPH and snow loads of 23lbs/sq/ft. for most zones. We seal the ends of the panels with aluminum tape which creates dead air space. This gives the same effect as double glazing. For ease of assembly, all greenhouse patio room kits are supplied with a comprehensive assembly manual, plus a DVD showing each stage of assembly. 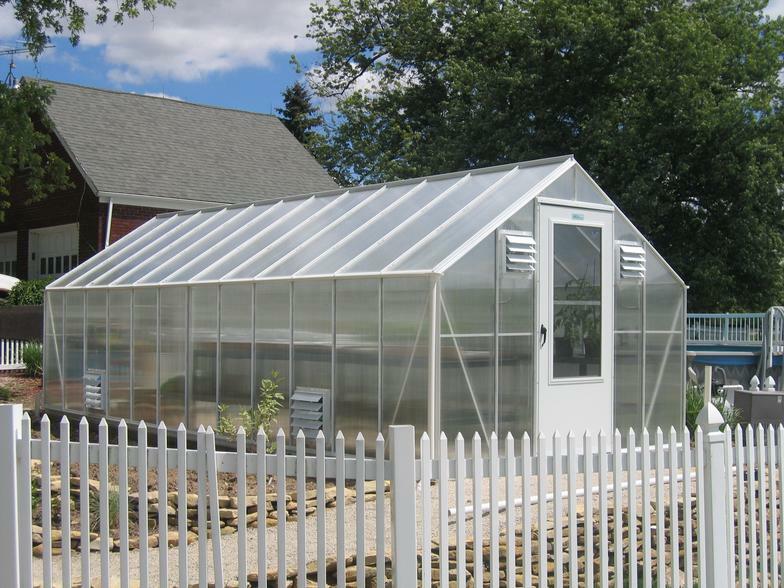 All Greenhouses come with a ten-year warranty on the frame against decline due to faulty workmanship. The polycarbonate also carries a ten-year warranty against yellowing. Schaefer Ventilation products carry a one-year warranty on their equipment. The bottom line is this: We sell a Greenhouse the same way we like to buy one. There are no hidden costs or pushy salesmen trying to make you spend money on extra features and supplies. There are additional accessories that you may need depending on how you wish to use your greenhouse and the amount of control you need over the internal environment. 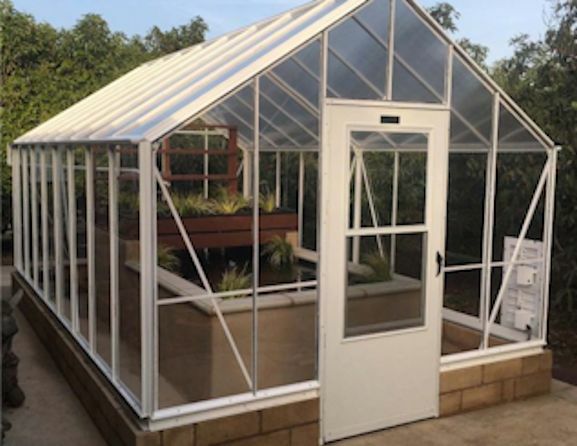 Necessary equipment for your greenhouse differs greatly from someone growing orchids year round to some one wishing to get a head start on their spring gardening. However, you will never be pushed into buying something you don’t need from us. We respect our customers and know that they are the foundation of this company. 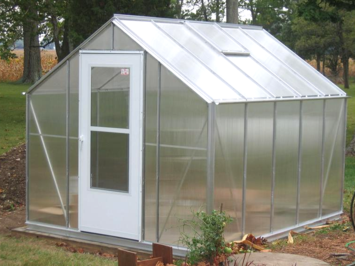 The greenhouse includes the base frame, which is an integral part of the unit. We include the air exhaust system. In extreme climates this is a necessity both to help control temperature build-up and provide good air flow for the plants. The system consists of a shutter fan, a motorized vent (or vents depending on greenhouse size), and a thermostat all parts are top of the line manufactured by Schaefer Ventilation Equipment. All walls are solid clear UV Treated Polycarbonate with Wall Panels as Clear as Glass. use for Greenhouse, Sun room Or for the Hot tub.